Probably the most compact way to increase the capacity of your outdoor kitchen! 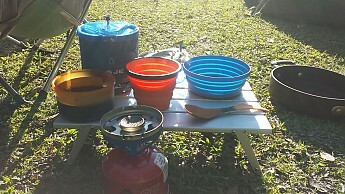 So I was just messaging a fellow TS member and I remembered I should do a review of one of my favorite pieces of outdoor kitchen gear...the STS X-set. To be clear...I only have the mug and bowl. The larger set comes with a plate that nests with both the mug and bowl...but I find plates as useless as forks outdoors...and the plate makes it so the set will only nest with the largest of outdoor cookware. Speaking of nesting…that is really what sets this set apart from a lot of others. 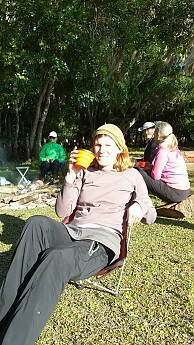 More often than not I can be found enjoying the outdoors with groups between 2-3 people…and this is right where the x-set starts to shine....as you add an additional mug and bowl for almost no space. In theory if I wanted to service larger groups I would simply buy larger cookware and more x-sets…as the advantage of these nesting mugs and bowls only gets exponentially better as the size of the group increases. All the nesting in the world would be worthless if the performance and function of the x-set was sub-par…but I find the x-set performs marvelously. There are little small bands of plastic strategically placed on the mug and bowl which make handling hot liquids in the mug and bowl pain-free. On the mug the plastic ring sits right at the top and is best used holding the mug between thumb and middle finger like you might a donut. 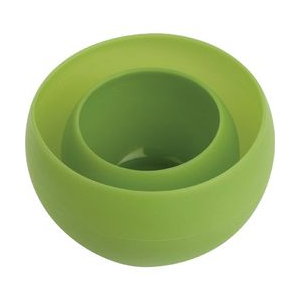 For the bowl…the plastic is positioned on the bottom so that you can hold the bowl in the palm of your hand. I and many others have used this set with hot liquids on more occasions than I can count…and I am completely satisfied with the performance. The one complaint I might have (but I don’t) is that you do need to hold the mug and bowl in very specific ways to keep from getting hot fingers and hands…but the sides of the cup and bowl never get so hot that they will blister skin…and using them the appropriate way is not that difficult…so this is not as bad as you might think. I also find the mug a little unbalanced…but not detrimentally so…and if it had a lid I would probably be through the roof about it! Which brings me to my next point…I do not think the x-set is particularly useful for the soloist…you can use the x-set to expand your solo-cooking options (which I do…and it serves well for mixing and rehydrating)…but there are other cheaper and more effective ways to do this. Moreover…in my solo-kit I find that an insulated mug with a lid is FAR superior to the x-mug. In my solo-kit my insulated mug nest snuggly in my pot…and so it uses about the same volume as the x-mug (only in a different way)…but keeps my drinks hot and cold much longer…and a lid would let me have hot and cold drinks on the go! 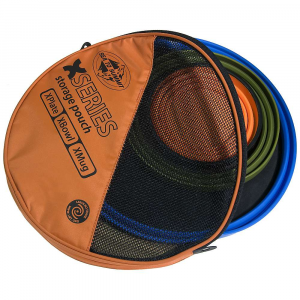 To summarize then, the mug and bowl x-set is probably one of the best ways to increase the number of people your camp-kitchen can feed…and it only seems to get better with the larger the group you are serving. It is however not something the average solo-backpacker is going to have a lot of interest in or need for…unless he or she is planning elaborate multi-component meals. So if you find yourself outdoors with others…or would like to…I would certainly check out this very versatile and practical set…you will be happy that you did. You're silly Eric...but yes...it probably would work as a frisbee! Unique and innovative products that fill the niche of collapsible dishware, this two-piece set includes the X-Bowl and X-Mug. This is a good solution to increasing the size of your soloist cookset in order to accommodate additional companions, without significantly increasing occupancy inside your packed spaces. X-Bowl: 5” dia. (though I measured 6”) x 2.25” tall, 650 ml capacity, 2.9 oz. The bottom is solid and can be used as a small cutting board. X-Mug: 4.5” dia. 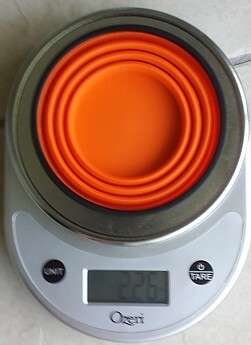 x 3.25” tall, 480 ml capacity (I measured only about 400 ml), 2.2 oz. The mug has a solid rim which facilitates sipping and handling. 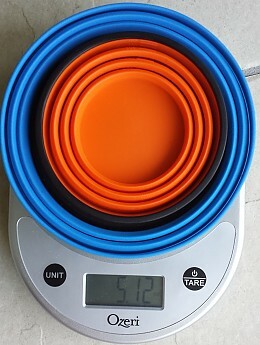 The mug and bowl set weigh a little over 5 oz. 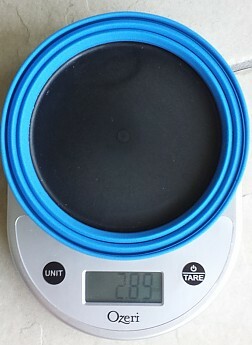 ; 5.9 oz. if you include the complimentary storage bag. They reportedly withstand a temperature range of -40° to 180° C. I didn’t test this. All products are made from BPA-free, food grade, heat-resistant silicone. 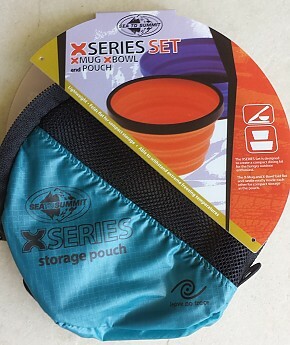 These collapsible products come in a variety of sizes and combinations sets and are also sold separately (X-Mug and X-Bowl). 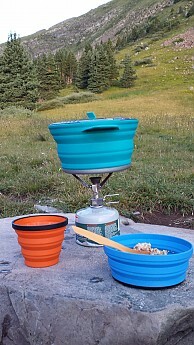 There is also collapsible cookware such as the X-Pot, X-Pan, and Kettle. But I should note here, neither the Mug nor Bowl can be used on the stove to heat liquids! More information can be found on the Sea to Summit website. 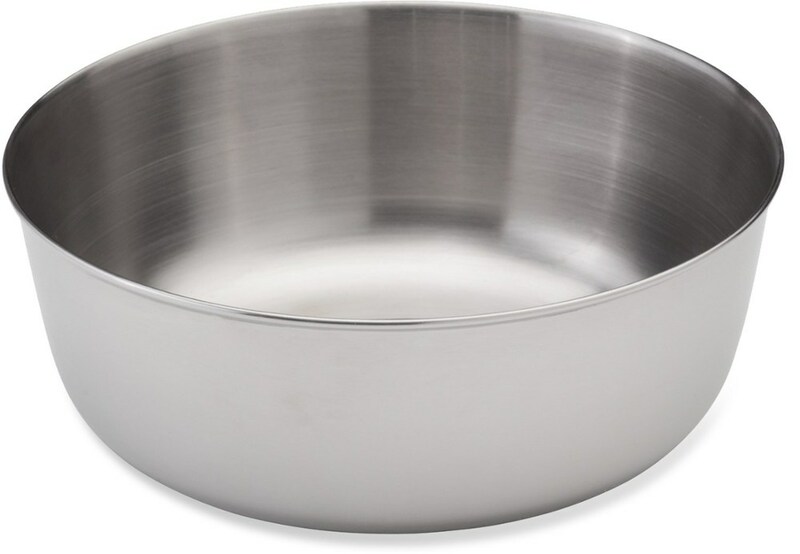 My first thoughts about the X-Set bowl and mug is that they are a good alternative for expanding a solo set of cookware, like a Jetboil system. Since such a cookset already comes as a compact and complete modular design, there is no room leftover to add odds-and-ends dishes. This makes for awkward pieces floating around in your pack. The X-Series come as modular sets and take up less space, when collapsed. This makes them ideal to have around for when that non-committal friend(s) finally decides to drop-in on your excursion, lacking any of their own gear. The collapsible silicone walls make the pieces easy to grasp and cool to the touch almost immediately after adding hot contents. The X-Mug has a plastic stiffening ring at the rim that helps keep the sides from collapsing and facilitates sipping and grasping (though does not fare as well at pouring, as I found out in trying to transfer water from the mug to another container…water dribbled down the sides a bit). The X-Mug has gradations in milliliters and cups, both fourths and thirds of a cup. 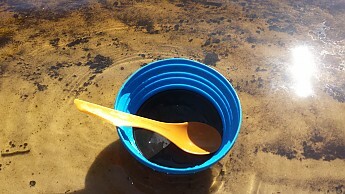 So it is useful as a measuring device too, despite its lack-luster performance in pouring. 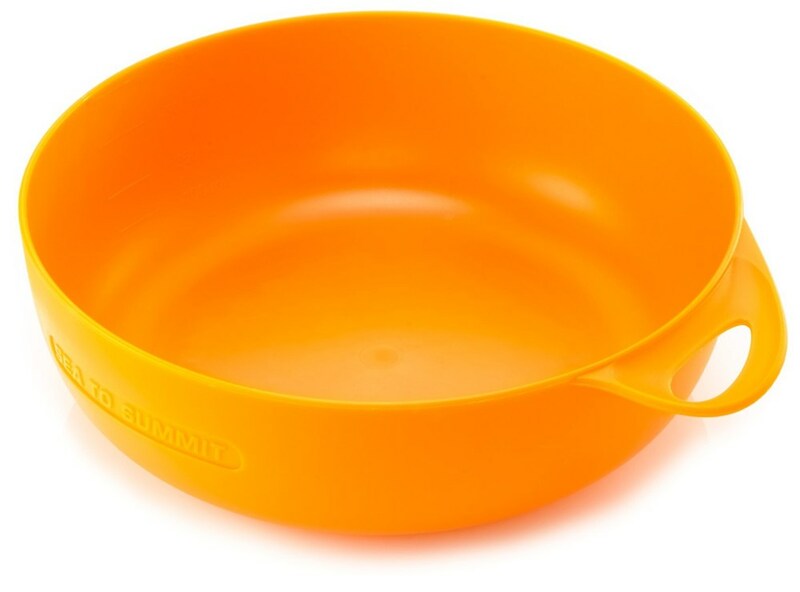 The X-Bowl does not have gradations but has a solid bottom, similar to a plastic cutting board, which it incidentally can be used for, if chopping small items. Beware slicing through the silicone walls with a sharp knife, though. The bright colors of all the collapsible products have the added effect of making them hard to misplace or forget behind in your campsite. 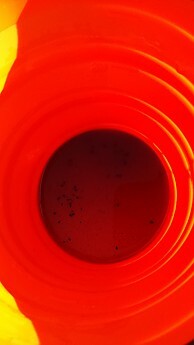 It is also easy to see if you have grinds in your coffee. 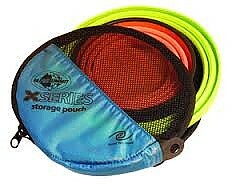 The ‘packability’ of the X-Set is excellent, after all, this is the product’s main selling point. The best way to collapse the pieces is to place a hand flat on top and push straight down (atop a flat surface). They collapse instantly in one easy motion. Unfolding the products takes a few more steps, but you’ll easily figure it out. All pieces can be set up or stored away in mere seconds. 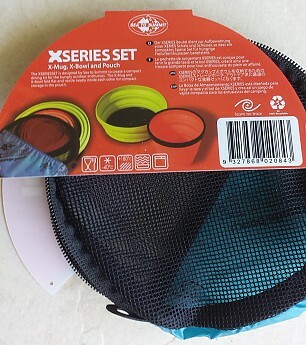 The Mug and Bowl nest conveniently inside many other products from the series, such as the X-Pot. 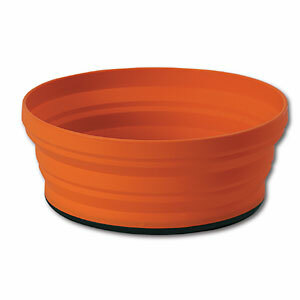 In fact, there may be room for a second mug/bowl set in the X-Pot, but as I only received one, I couldn’t test this. It looks entirely possible, though. At just over 5 oz. for the set, the mug and bowl are perhaps a bit heavier than hard-sided Lexan or metal containers, but not prohibitively so. 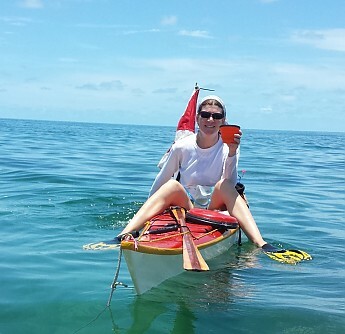 The solo minimalist is probably not this product’s intended audience, being more ideal for couples or even larger groups traveling together. Or for when space is more critical than weight. 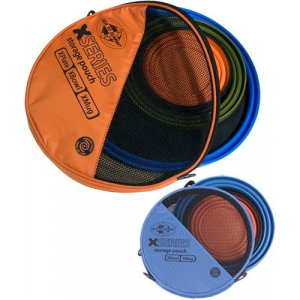 As such, they are a perfect solution for a bicycle pannier, kayak hatch, or motorcycle bin. Construction and durability appear to be good. I was concerned that the silicone might add or retain flavors and I have noticed this to some extent with the X-Mug. At times, I felt like I tasted an odd plastic flavor when I have used the mug for hot coffee. I can also smell a slight aroma of coffee after washing the mug. Since coffee is a pretty strong and caustic substance, this is not all that surprising. As for the bleeding of flavors, I am still not convinced this is what I’m experiencing. Perhaps it’s just stale coffee. Generally I prefer to drink hot liquids from a ceramic or stainless steel container, and given this bias, it could be just in my head. 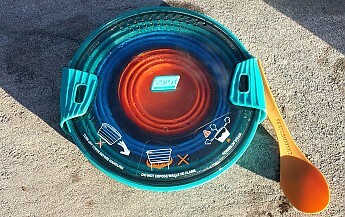 All products are stated to be BPA-free and food safe and I have not had this issue with the X-Pot or X-Bowl. 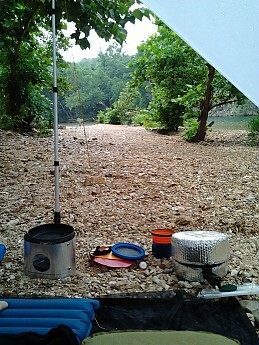 Conditions: I tested the pot and dish set on multiple day and overnight trips over the past 4 months. I used the products in a variety of conditions ranging from sea level to 11,000 feet and 40-80 degrees F.
In summary, these are versatile products, most appreciated in situations where space is more critical than weight or for groups of two or larger. Thank you to Sea to Summit and Trailspace for allowing me to test these products. Nice review, Lah! Thanks for taking the time to test out the various X-pieces. These are super nice. Nice job, Lah! Great explanation of its uses and versatility.